Just a few weeks after the end of the 1939 camp season, Germany and the Soviet Union invaded Poland. The following spring, Germany invaded Denmark, Norway, and France, and the Soviet Union invaded Finland. Those events shook the American people’s non-interventionist tendencies, and an improbable presidential hopeful, Wendell Willkie, campaigned on supporting Britain right up to the cusp of war. Both those opposing intervention and those for it called upon an American nationalism to justify themselves. The non-interventionists recalled George Washington’s warning about entangling alliances, and the interventionist tried to rally their countrymen to support democracy around the world. 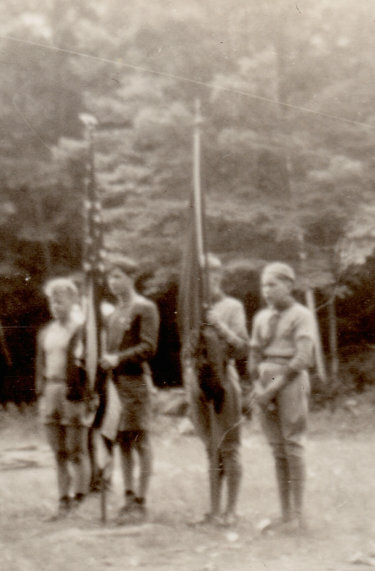 The 1940 summer program offered an increased number of activities for more experienced Scouts. These veteran Scouts were assigned to the Rocky Ledge campsite, while the tenderfeet stayed in Poplar Grove. The smaller group in the Rocky Ledge Campsite was easier to accommodate on outpost treks. These Scouts left for a hike each Tuesday Morning, returning the following day. This new emphasis on older Scouts allowed some of the more experienced canoers to head to Winchester and paddle around Highland Lake. These programs may have factored into increased attendance in 1940; that summer, weeks two and three were filled to capacity, and during week four there were more Scouts in camp than bunks in Adirondack Shelters. The image below shows Scouts assembled on the parade ground during the 1930s.